Jones pinned Valentine in a fence match, known today as a cage match. As Jones pinned Valentine, Valentine put his leg on the rope to break the count. The referee did not see this, and Jones pulled Valentine's leg off the ropes before the three count ended. Valentine protested, Ric Flair came down to ringside and protested as well, but referee Angelo Martinelli raised Paul Jones hand and awarded the title belt to Jones. 3/19/75. Announced at the TV taping in Raleigh (airing in most markets on 3/22/75) that Jones had been stripped of the title and the belt returned to Johnny Valentine by NWA President Sam Muchnick. Valentine is now recognized as champion. Valentine announced on the WRAL TV taping on 3/12/75 that he had sent the film of the 3/9 match in Charlotte to NWA president Sam Muchnick asking that the film be reviewed and the title returned to him since he his leg on the rope and the count should have been stopped (see Paul Jones above.) 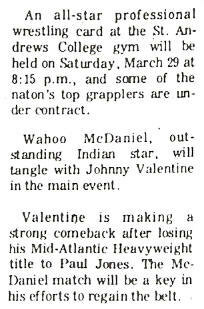 Muchnick reviewed the tape, ruled in Valentine's favor, and returned the title to Johnny Valentine, announced at WRAL TV taping on 3/19/75. In the summer of 2005, I stumbled across the first of what would eventually become five pieces of evidence of a 1975 Mid-Atlantic title reign by Paul Jones that had never previously been recognized. 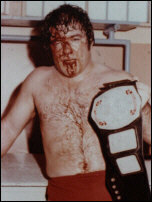 The first evidence came in the form of a Gene Gordon photograph that you see above of a bloody Paul Jones holding the Mid-Atlantic title belt, apparently shot in a locker room after a match. The copyright owner of the photo, Scooter Lesley, asked if we were aware of Jones ever holding this version of the Mid-Atlantic title. This version of the Mid-Atlantic belt was only around from October of 1973 until some between March and July of 1975. We had never known of a Paul Jones title reign during this time or him holding this version of the belt (Jones held a later version of the Mid-Atlantic belt in 1982), and we were very curious as to the story behind the photo. 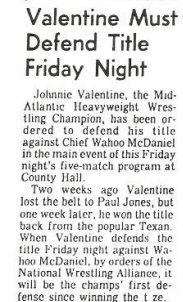 A few months later, I came across an audio tape of a Greenville SC radio interview from November of 1975 where Paul Jones mentioned defeating Johnny Valentine for the Mid-Atlantic title and NWA president Sam Muchnick stripping him of the belt and returning it to Valentine. I immediately thought of the photograph of Jones with the title, and began trying to link the two together. 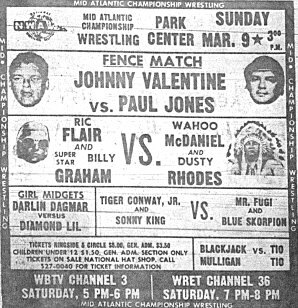 When I mentioned this to my friend Carroll Hall, an authority himself on the Mid-Atlantic area, he remembered seeing a film in 1975 on Mid-Atlantic Wrestling television of Jones defeating Johnny Valentine for the title in a fence match. Carroll pointed out that clips of that match could be found on a volume from the collection of 16mm Crockett arena matches that have circulated since the early 1990s (widely known as the "Cornette tapes"). Not long afterwards, we found the actual audio from the TV broadcasts where Jones was recognized as champion. Valentine also announced on these tapes that he would be taking the film to the NWA for review, and then a week later the NWA president Sam Muchnick returned the title to Valentine. Research by Mark Eastridge has uncovered further evidence of the title change. 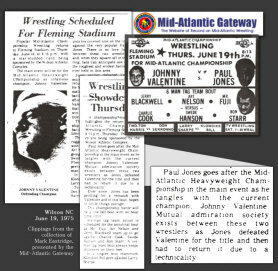 The most significant piece of this evidence is a newspaper ad for a card on March 18, 1975 in Raleigh's Dorton Arena (seen below) which promotes Jones defending the Mid-Atlantic title against Valentine, and specifically mentions Jones as the new champion. 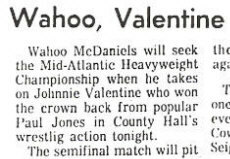 Also, two newspaper clippings promoting a 3/28/75 Charleston SC card at County Hall mention Jones' victory over Valentine a few weeks earlier, and Valentine subsequently regaining the title. Later, Eastridge also uncovered this rare clipping promoting a March 29, 1975 card in Laurinburg NC, also mentioning Jones as champion. 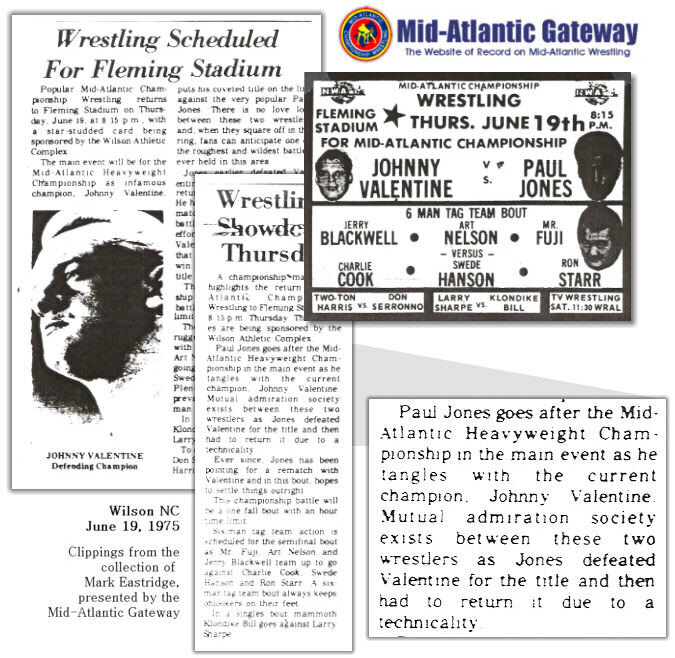 Yet another set of clippings from a June 19th Wilson NC card made several mentions of Jones having won the title, but having to "return it" on a technicality. Click the above image for a larger view of these clippings. Feeling as though I had discovered some long lost treasure, I immediately began going through the thought process of whether the Paul Jones title win should be recognized. My initial thought was that it should not be recognized because the title was "returned" to Valentine. However, I started reviewing other evidence and took into consideration a situation a year later involving similar circumstances with Paul Jones and Blackjack Mulligan over the United States title in December of 1976. In this case, Jones had defeated Mulligan but the NWA (this time by ruling of president Eddie Graham) again took the title from Jones and returned it to Mulligan after a review of the film of the match. In this case, the title change was clearly recognized and in later accountings of title reigns, Jim Crockett Promotions gave both Jones and Mulligan credit for those title wins. 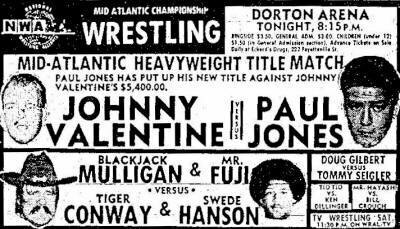 An argument can be made (and I am basically making it here) that if the Jones/Mulligan U.S. title switch in 1976 was recognized, then the Jones/ Valentine Mid-Atlantic switch in 1975 should also be recognized.
" It was clear on the description [on the Gateway] that the March 9th match ended in controversy (Valentine's foot was on the rope) and NWA President Muchnick returned the title to Valentine on March 19th when he reviewed the tape. On the description you gave, my impression is getting the belt returned tells me Paul Jones' title reign here is invalid from the start and that Valentine's Mid-Atlantic title reign starting from January 1974 should be still unbroken. In my point of view, these two title switches should be footnotes at best. - Billy Wong, Boston MA." That is indeed a reasonable way to look at this. But "reasonable" and "wrestling history" don't always see eye-to-eye. 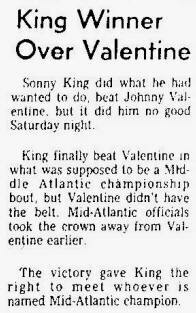 One could also reasonably argue Valentine's reign as Mid-Atlantic champion had a dubious beginning in the first place, since he apparently never won the title in the ring. He was awarded the title when reigning champion Jerry Brisco briefly left the territory while champion. Valentine was simply given the title, much in the same way he was given the title following this win by Paul Jones. If Valentine's initial reign is recognized after being simply handed the title, certainly Jones should be recognized for winning it in the ring. Paul Jones pinned Valentine in the ring on 3/9/75, no foot on the ropes at the final third count. His hand was raised by the referee and he was given the title belt. 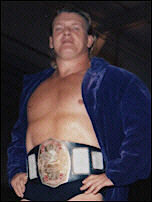 Jones appeared on TV on 3/15/75 with the title belt on, and was announced as champion. Jones defended the title at least once, on 3/18 in Raleigh, during the period after he won the title in Charlotte and before having Sam Muchnick strip him of the title. This actual defense of the title adds a level of authenticity and credibility to a claim of being recognized as Mid-Atlantic champion. Several newspaper reports document Jones' title win over Valentine, as seen above. Crockett Promotions recognized the Jones/Mulligan U.S. title changes that took place in almost identical circumstances in December of 1976. The three count included Valentine placing his leg on the rope as the count started, but Jones subsequently removing his leg before the final count of three. When the third count was made, Valentine's leg was no longer on the rope. In the end, it was the similar situation with Mulligan and Jones and the U.S. title a year later, as well as Jones actually defending the title in the ring, that carried the most weight and that ultimately led to the decision to recognize the switch between Jones and Valentine. Also, Jones won the U.S. title from Valentine and then was stripped of the title. The title reign was not declared null and void, just as other title reigns where a champion was later stripped of a title are not declared null and void. The title was then returned to Johnny Valentine by decision of the NWA president. These arguments, and the decision to recognize Jones' title reign, are certainly controversial, especially to those who might prefer to recognize Valentine's Mid-Atlantic title reign as one single, uninterrupted 18 month reign. But based on documented evidence and precedent, we recognize the switch in our title history, with the supporting arguments made above. I eagerly solicit further feedback and opinion on this subject at midatlanticgateway@gmail.com.